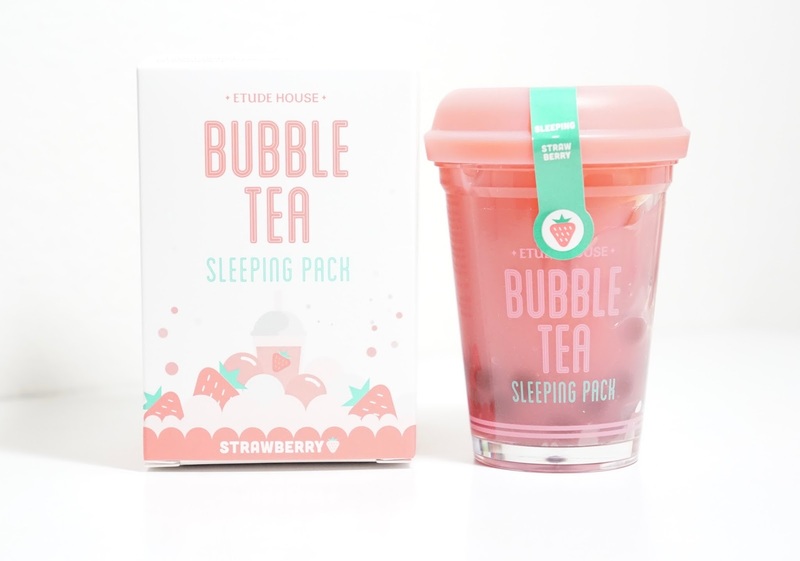 The latest Etude House Pink Bird Box included the Bubble Tea Sleeping Packs! It's the first only skincare Pink Bird Box that I've received and they're incredibly adorable. There are three "flavors" and they are Strawberry, Green Tea, and Black Tea. If you were to buy them individually, each sleeping pack retails for $13.20 and contains 172 grams of product but you can also buy them in a 3 pack for $39.60. You can buy these or any of their products on the Etude House global website here! Each sleeping pack targets certain skin care concerns, but they all have the same concept to give your skin more moisture and elasticity throughout the night. For fragrance, I was expecting them to smell strongly of their respective flavors but it was more subtle and it was mixed in with a more stereotypical "skincare" smell. 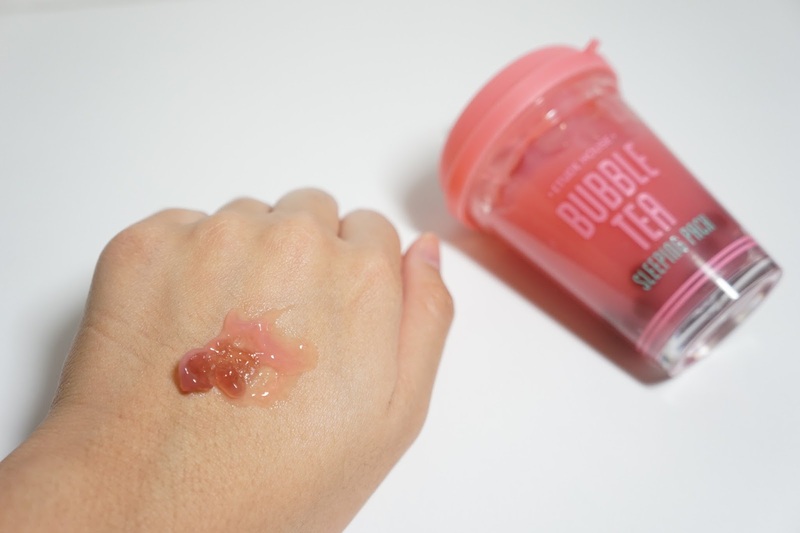 The Etude House Strawberry Bubble Tea Sleeping Pack* claims to make the skin healthy and dewy. As you can see, they're bubble/milk/boba tea inspired. With the included spoon, you can scoop out some of the gel with a boba/pearl/bubble, "pop" the bubble, and then message it into your face. I apply a generous amount about an hour before I sleep so that it can mostly sink in and then wake up with glowy skin! It doesn't take much to break apart the bubble and it mixes really well into the gel to make it smooth again. 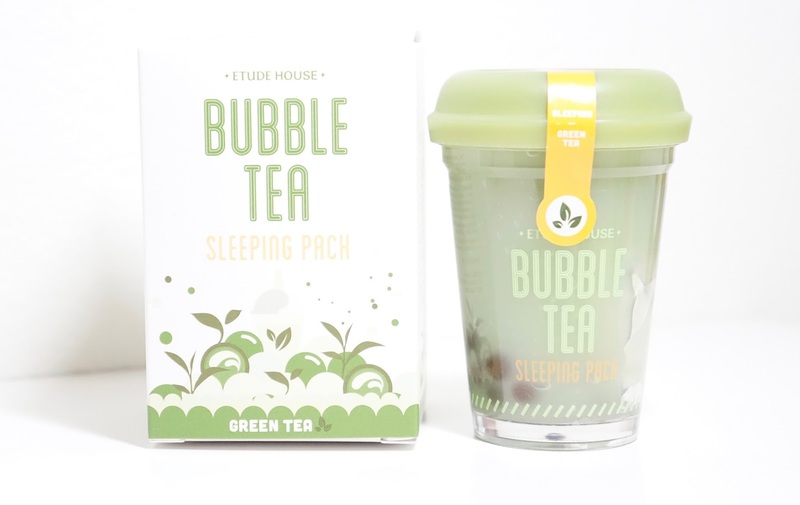 The Etude House Green Tea Bubble Tea Sleeping Pack* claims to make the skin clear and clean. 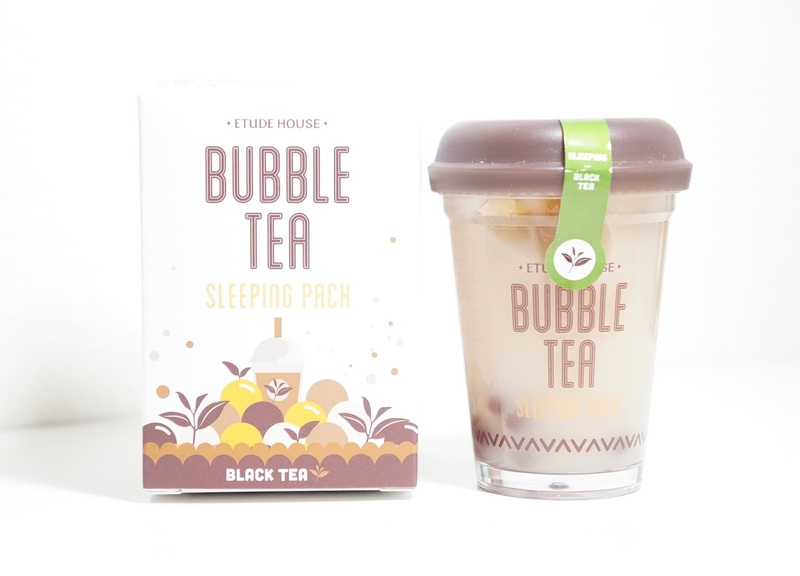 The Etude House Bubble Tea Sleeping Pack in Black Tea* claims to make the skin glow and plump up. Like the other Etude House Pink Bird boxes that include skincare, it's going to be a bit hard for me to describe any long term results. I diligently used a sleeping pack every night to for about 3 weeks to really test them out, and so my review is just going to be based on that time frame. Considering how I used more than 2 pea sized amount of product, I'm pretty surprised that I didn't break out or get clogged pores and that's the biggest plus. When I tried out the Toning White C Double Effect Sleeping Pack (review here), I would use a thin layer every other night and then switched to using a bigger amount every night. Some of my pores on my cheeks got clogged, but it luckily didn't turn into painful blemishes. 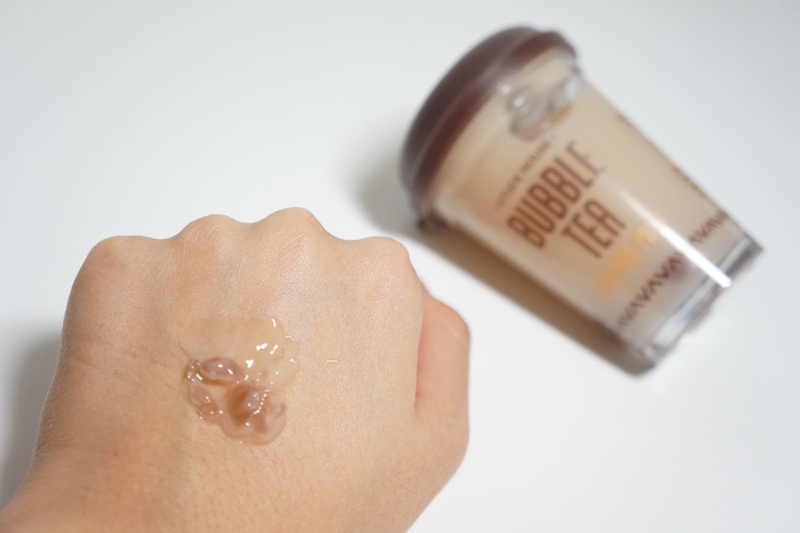 If you're looking for moisture, I would recommend the Bubble Tea Sleeping Packs but if you're looking for whitening effects, I would still recommend the Toning White C Double Effect Sleeping Pack and to just use it not as frequent as I did. I didn't see a huge difference between the Bubble Tea Sleeping Packs, but I did prefer to use the Green Tea Sleeping Pack. 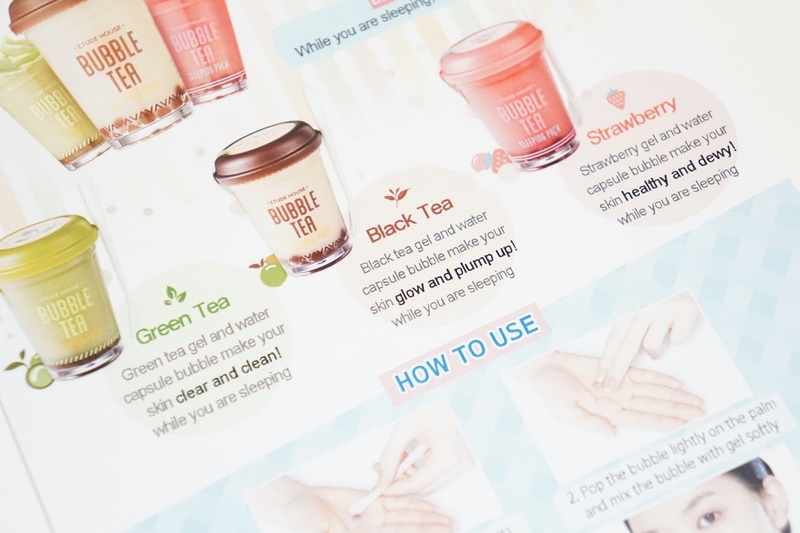 The Black Tea and Strawberry Sleeping Packs worked pretty similarly on my skin and so if I were to recommend one of the two, I would say to just choose base on aesthetic preferences. 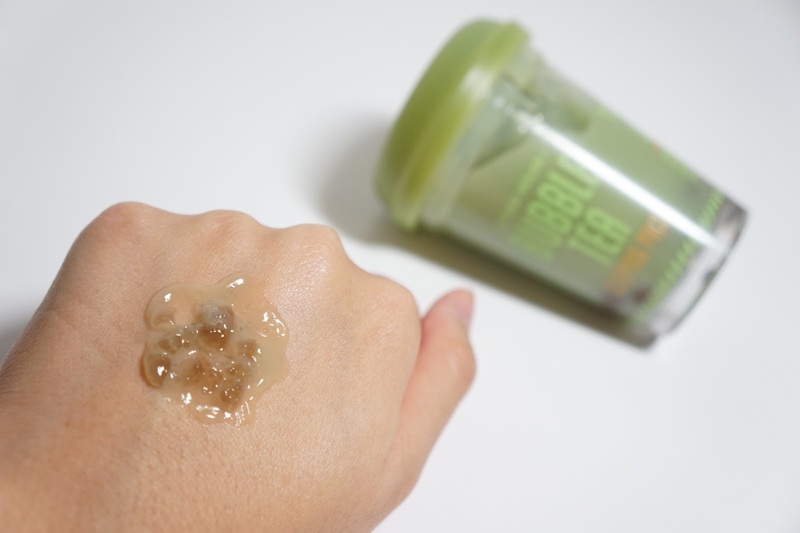 They were both still good and left my skin looking beautiful in the morning, but the Green Tea Sleeping Pack had the added acne benefits and so that one worked better for me. The bubbles are the key to adding more moisture and so if you're not getting enough, just add another bubble into your mixture. I personally try to get an even mixture of the gel and bubble though. Even though there's a translucency to the gel, I can't see through it enough to gauge how many bubbles there are. I don't want to risk running out and so I try to be as even as possible or add more gel into my mixture. 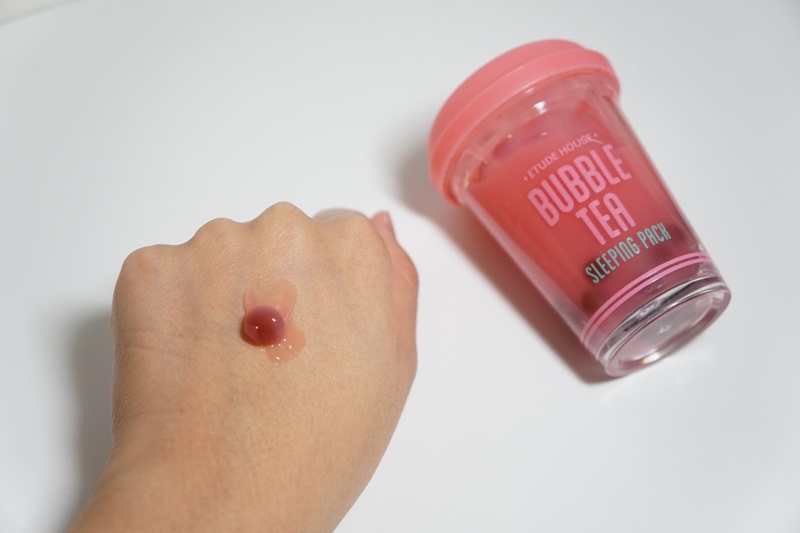 Final thoughts: I'm really enjoying these Bubble Tea Sleeping Packs and I'm eternally grateful that Etude House sent me all three to try out. I have dry skin and I've been trying to find stuff to add into my routine to give me more moisture. As I mentioned, I can use these every night and won't break out and that's the biggest win I can hope for! 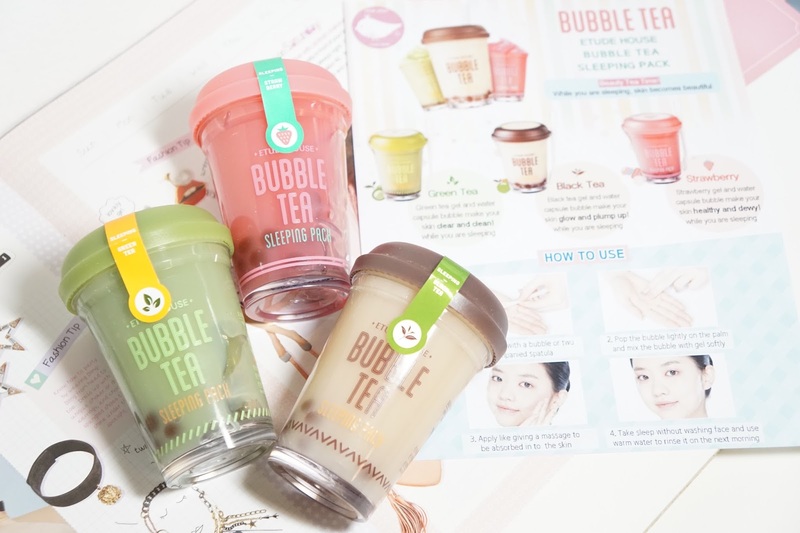 I personally loved the Green Tea Bubble Tea Sleeping Pack more but I would still recommend the other "flavors" if their claims are more aligned with your skincare needs. There is a lot of product and I'm not afraid of running out soon, but I am kind of worried about running out of bubbles before the gel though. These sleeping packs won't replace my love of facial oils for added moisture, but they definitely help boost up the moisture that my skin has been needing lately. *These products were sent to me for free as PR samples as part of their Pink Bird Program. As part of their program, I get sent a box of products each month to review. All opinions are my own and 100% honest.